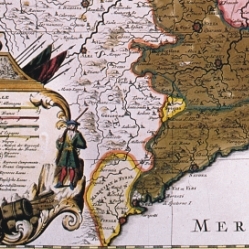 Description: North Italy, from Liguria to the borders of Switzerland, with Milan in the centre. At the top a coloured picture of war scenes in Cremona shows the entrance of the Prince of Savoy with three thousand men. The map also includes a fine description of the mountains, of the water courses, of the borders of the states and of the main roads. 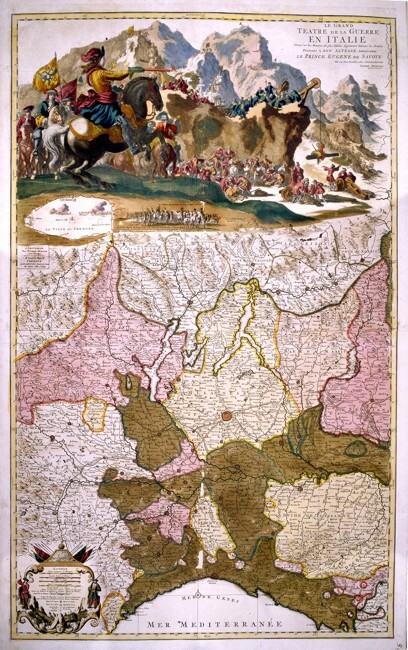 This splendid vertical map, drawn by the engineers in Eugenio of Savoyâ€™s army, was printed in Amsterdam by Pierre Mortier and measures 97 x 59,5 cm.